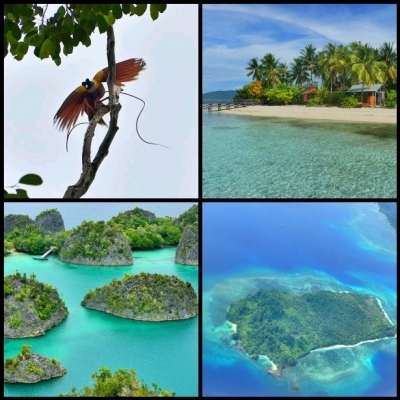 Raja Ampat Islands is part of the Tentative list of Indonesia in order to qualify for inclusion in the World Heritage List. I visited these remote islands in West Papua, Indonesia in September 2018. To get there I caught a series of internal flights (Garuda Indonesia is the most reliable overall) via Jakarta and Mekassar, Sulawesi until we landed in Sorong Airport. From there we took an airport taxi to the Sorong ferry harbour where we bought our 'VIP ferry tickets' (important if you have big luggages and want comfortable seats and air condition) to Waisai island. I must say that considering that there are no international flights to West Papua and limited infrastructure, the Raja Ampat Marine Park management and entrance permit system is top notch. Other parks and indeed WHS such as Komodo NP should really emulate Raja Ampat's system which is really simple and practical. Upon disembarking from the ferry at Waisai island and before heading to the different small boats which take you to different home stays or smaller islands, there is a make shift booth welcoming visitors where you currently pay 1 million rupiah and a laminated credit card format permit with your name is printed on the spot and is valid for 1 year. No more snorkelling fees, ranger fees, conservation fees and hassles as per Komodo NP for example. We had booked online at a home stay island (top right photo) with rudimental over-the-water rooms and already the choppy currents to get there were a premonition of what was yet to come in the coming days. In all we spent 4 nights there and visited different islands and snorkelling spots. One of the main reasons I was eager to visit such a remote place were the endemic birds of paradise which I previously believed were solely Papua New Guinea's endemics. On a low tide moonlight trip to Gam Island at around 5am, we headed towards the largest bird of paradise's habitat. The Red Bird of Paradise (top left photo) could be heard immediately as we approached the island and after a 30 minute ramble/walk to the higher rainforest area of the island in the dark with an ornithologist, we waited till sunrise till the beautiful noisy Paradisaea rubra males performed their mating display on the tree-tops. It was a birdwatchers dream come true to see such an amazing spectacle even though upon my return to the coast I noticed that the vicious mosquitoes present had bitten me through my thin long-sleeved shirt even though I put a lot of DEET mosquito repellent and wore a mosquito repellent wrist band! On Waigeo island we spotted and heard the much smaller but nonetheless Wilson's Bird of Paradise. During our 3 and a half weeks in Indonesia, we noticed that bird trapping is a very concerning issue all over Indonesia with practically every other house, bar, restaurant or building sporting all types of colourful birds in small cages - birds of prey, woodpeckers to kingfishers, from mynas, parakeets and parrots to small passerines and doves. Every village seems to have a bird market and it's no wonder that wild birds in urban or rural areas are almost non-existent. West Papua, while technically part of Indonesia, couldn't be more different than the rest of the country. Apart from the two species of birds of paradise, other highlight endemics or peculiar species we spotted were the Western Crowned Pigeon, the Papuan Hornbill or Blyth's Hornbill, the Common Paradise Kingfisher, the Waigeo Brush Turkey, the Yellow-faced Myna, the Willie Wagtail, Rufous-bellied Kingfisher amongst others as well as the cute common spotted cuscus marsupial. Another draw factor when choosing to visit Raja Ampat islands were the sea karst islands and coral reefs of Piaynemo and Wayag. We opted to visit Piaynemo which meant braving unbelievable rough seas, high waves and treacherous currents on a cheap speed boat to get there. Definitely not for those who get sea-sick easily or who hate long bumpy sea journeys but the view from the top is incredible (bottom left photo). In a way it is quite similar to New Caledonia's Upi Bay or Palau's Rock Islands but the surrounding coral reefs known as Melissa's Garden are a top-notch snorkelling and diving spot and are well worth the effort to get there. The Raja Ampat Marine Park is truly enormous and second only to the 'nearby' Great Barrier Reef. It is home to 540 types of corals, more than a 1000 types of coral fish and 700 types of molluscs. The corals seem very healthy with layers upon layers of marine life and they have not suffered from major bleaching. I think these islands deserve to be inscribed especially for their great effort in conserving such an outstanding place and the rather low human impact on such a vast area. PS: Make sure to secure a window seat top enjoy the view from above the coral reefs and islands (bottom right photo). The islands of Raja Ampat are right in the middle of the center of diversity of coral reefs and reef fish in the Indo-Pacific; it is hard to come up with a better reason than that to include anything in the list of World Heritage. I visited on board a ship dedicated to scuba diving, and boy was it ever worth it. The reefs are almost pristine, mostly because there are no large cities nearby and so there isn't much runoff or (many) fishermen. Huge schools of fish, both small and colourful and also very large (snappers the size of Volkswagens! ), sea snakes, dugongs, sea turtles. Oh, an on land there are birds of paradise, too. An amazing place.